Friday November 16 marked the date that the Churchill Chargers took on the Brandeis Broncos in the first round of playoffs. The Chargers(5-5) came in as heavy underdogs against Brandeis(8-2), but the Chargers shushed all the doubters that night. On the games opening drive Churchill marched down the field, and Derek Perez finished it off with a touchdown putting the Chargers ahead. The final ended 49-38, with the Broncos coming out on top. The chargers a heroic season fighting there way into playoffs, and giving a good team a huge fight. On a cold and miserable Friday the matchup between the Churchill Chargers and the Roosevelt Rough Riders took place. This matchup decided who would go to playoffs and it was a game for the ages. It was a close game throughout, but towards the end was when the real action took place. Down 20-10 with only a few minutes left the chargers had to act fast…. AND DID! Senior quarterback Derek Perez ran in a touchdown to bring the game within 3. Now it was up to the defense to give our offense another chance. On third down the Rough Riders decided to throw which was a costly mistake. 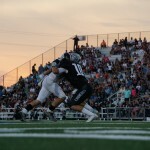 The pass was tipped by senior Luke rosas, and then tipped of the hands of Junior Braden Gill, and finally landed in the hands of sophomore Gavin castro. This gave our offense a shot to send us to playoffs. The high powered Churchill offense took it all the way down and scored to take the lead 24-20. With time running out,Roosevelt took their shot deep and failed. Sophomore Gavin Castro came in clutch again with another interception to seal the deal and send the Chargers into playoffs. They will be matched up against the Brandeis Broncos in the first round which is sure to be a great matchup. The mighty Churchill football team has fought back from a 1-4 record to a good 4-5 record putting them in the spotlight of playoff hopefuls. Only losing one in the past four games, the chargers have one opponent left to play. The Roosevelt Rough Riders. The chargers are usually victorious when matched up against the Rough Riders, but this matchup is so much more intense. With a win the chargers will end the season with a 5-5 record that will put them in the playoffs, but with a loss, their season will end with broken hearts and regrets. This seasons early struggles set the chargers back quite a bit, but they have fought back with heart, sweat, and tears to get a shot to make the playoffs, and there is nothing stopping them besides themselves.